In the past few years Dr. Raz appeared in exhibitions, articles and interviews, and his name is spreading throughout the Jewish communities of the American, Canadian and French. 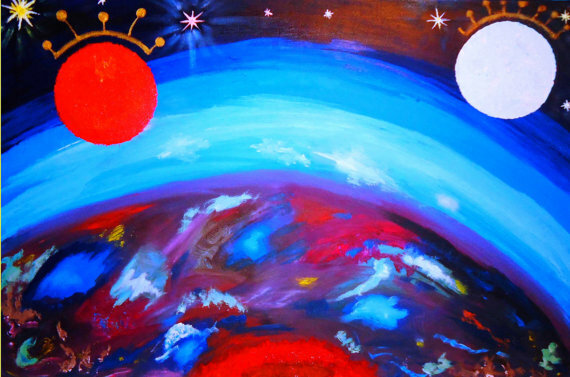 Here are some of the paintings that are currently for sale. The paintings are for private sale. To enquire regarding purchasing please be in touch using the form below the painting desriptions. Enjoy! Canvas or gloss paper. Available in several sizes. I love painting trees. 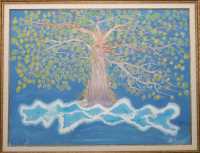 This is actually the original and first tree that I painted. Rabbi nachman explains - the Tzaddik, the righteous one, is like the tree, which protects the grass blades from the sun. Even those far away from the tree are protected, and they do not even know that they are being protected. Such is the Tzaddik, who protects those even far from him and those who do not even know about his existence. This tree serves as the basis for a children story named...The Tree With the Golden Leaves which is in the process of being published. And when will it be built with two hands? 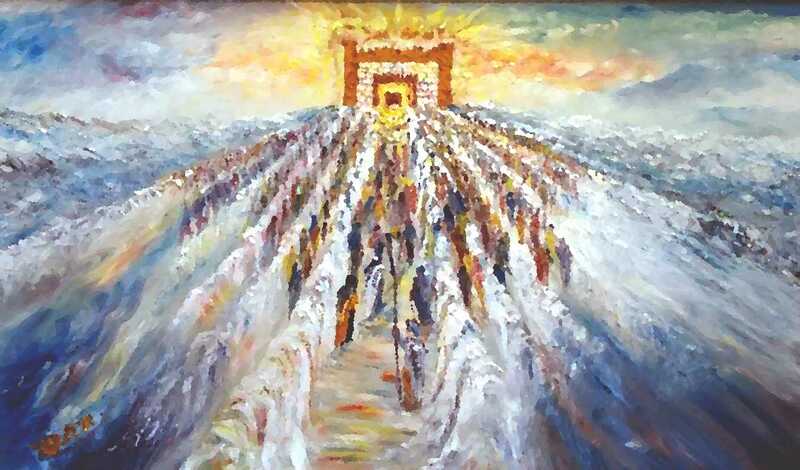 When the next verse in the song at the sea, "Hashem will reign for all eternity" is fulfilled. 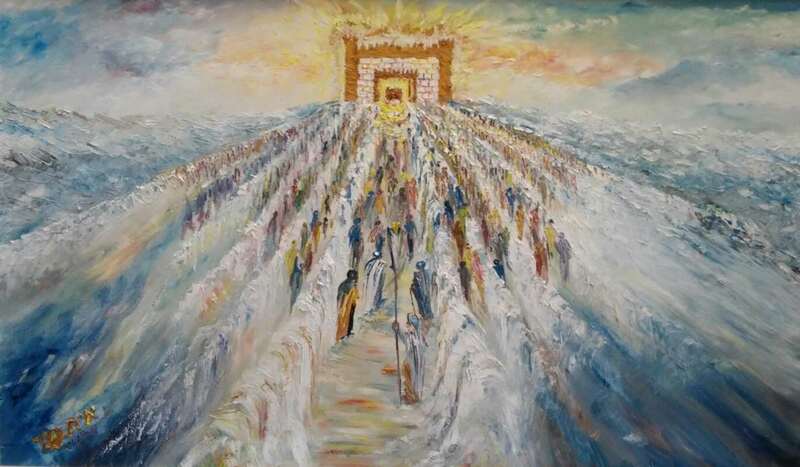 In the the redemption , the days of Mashiach – when all the reign will be His. 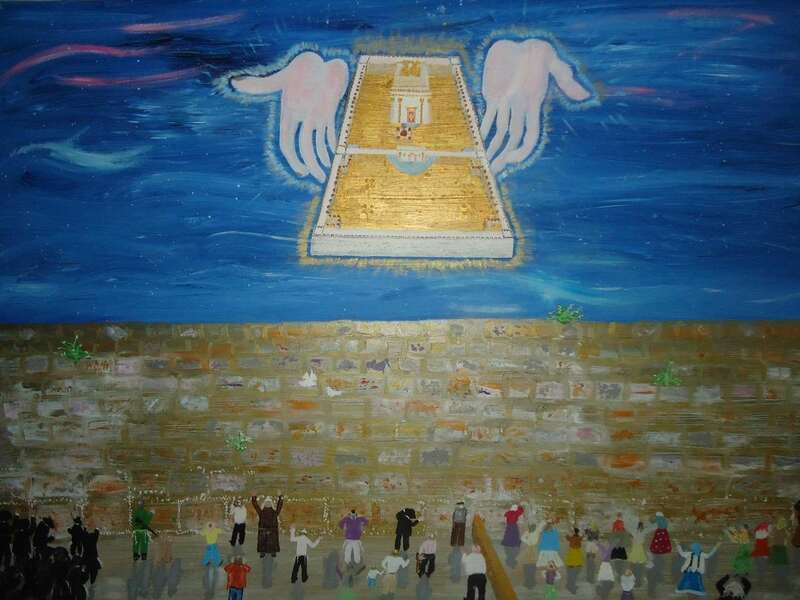 So the idea came to me to paint the Mikdash being presented to us from the hands of Hashem - coming down from Shamayim at the Kotel, where we have been praying for it for over 2000 years. Note that there are all types of people praying there, from very religious to hardly at all, from young to old. There is even a soldier pouring out his heart in prayer to Hashem. The women's section is also full of righteous women who are praying for salvation. 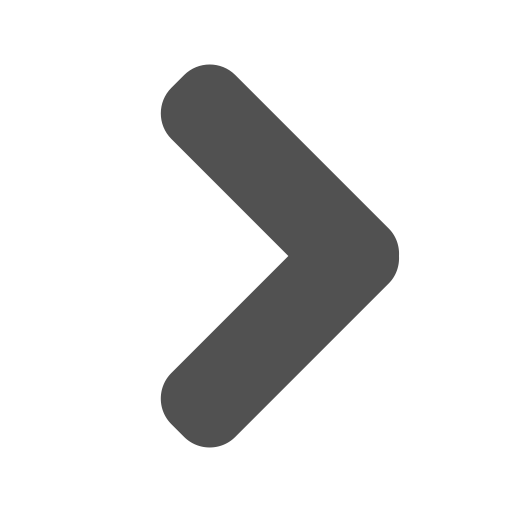 This is to signify the Achdut (unity) in Am Yisroel. We are all one, all children of Hashem, and Rabbi Nachman says that Mashiach will come when Am Yisroel is united!! So let us all unite in peace and ahavat chinam (baseless love) and Mashiach will come speedily, Amen! 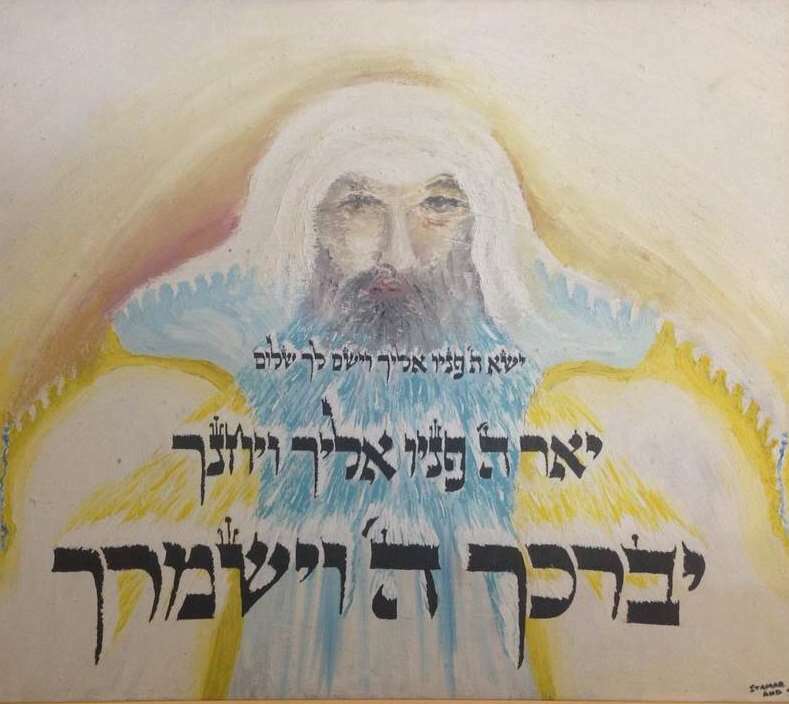 The blessing from the Kohanim (Priests) – descendants of Aharon the Kohen HaGadol (High Priest) – who bless us every morning, as is written in the Torah (below). The words come at you from the painting...A wonderful piece of work. 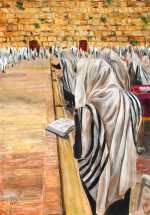 May we merit to be blessed by the Kohanim in the Beit Hamikdash soon, Amen! 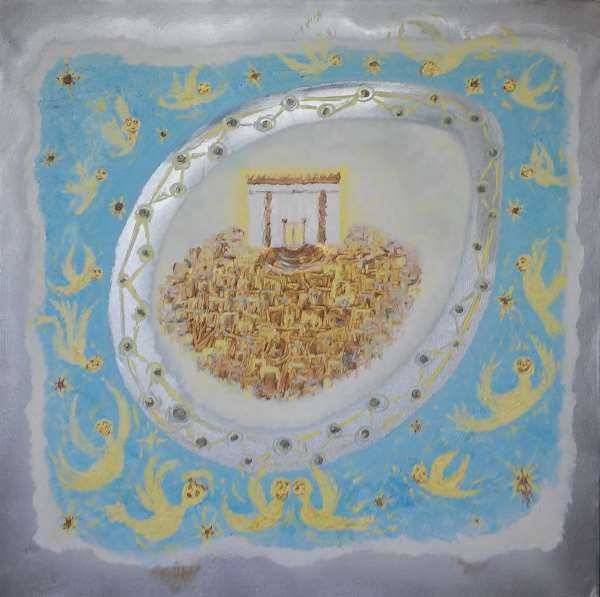 The motion of the people towards the temple (this part painted by Eliyahu Ohayun) as spcified by Dr. Raz, signifies that the people, as we are, always going through the split sea towards the Holy Temple. 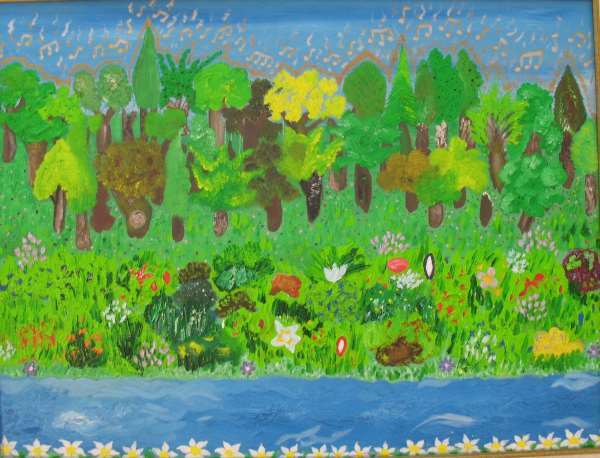 If you noticed, the top part of this painting is used in the header of this website. 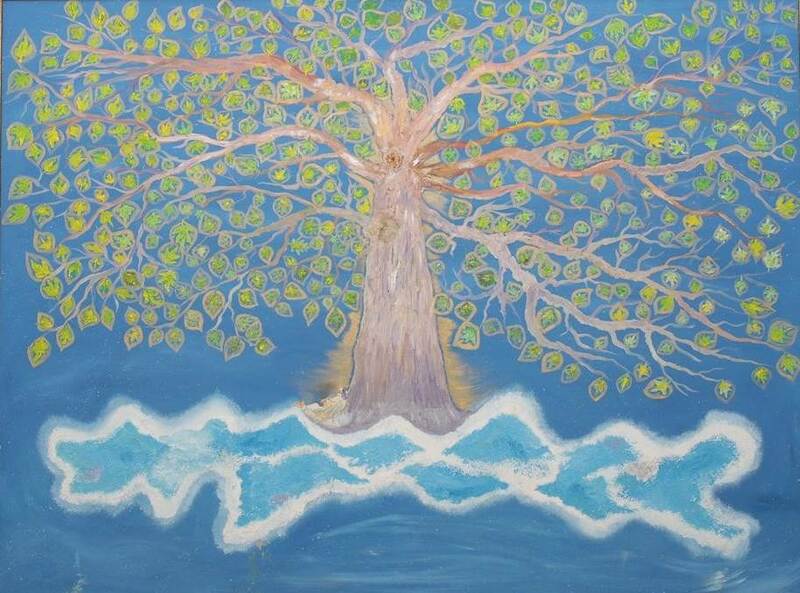 ..
May we merit to realise and thank Hashem for splitting the sea for us ever day, Amen! May we merit to sit with the Tzaddikim in Gan Eden, Amen! 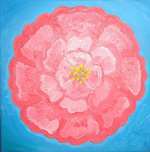 Israel is likened to the rose amongst the thorns, and the righteous of the nation of Israel are the light of the world. May we merit to be amongst the righteous of Israel, Amen! The place from which all holiness and light spreads out to. The whole world. And we are waiting for the eternal Mikdash to be built "...and the wolf shall dwell with the sheep''. No more wars. No more competition. A world of peace and tranquility. And it's up to us! Every mitzva brings it closer! Every good deed from each one of us! 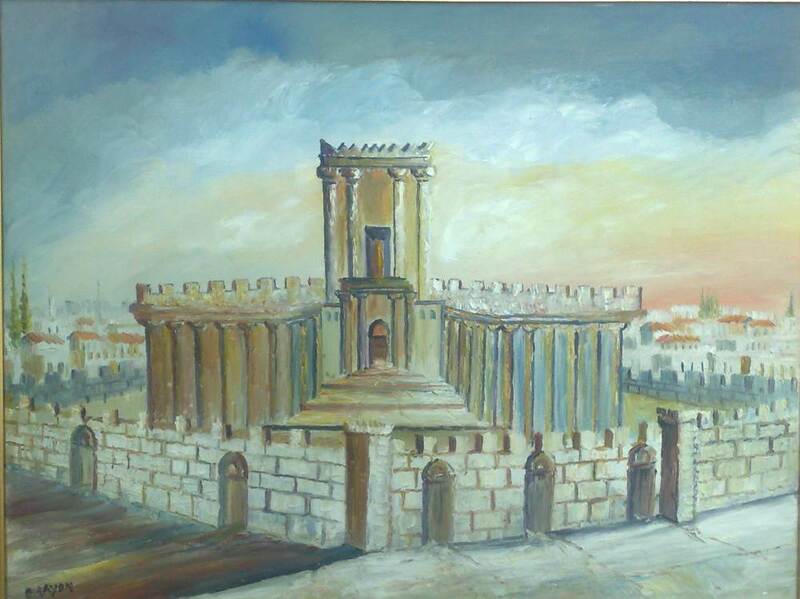 May we merit to see the eternal temple built speedily in our days. Amen! 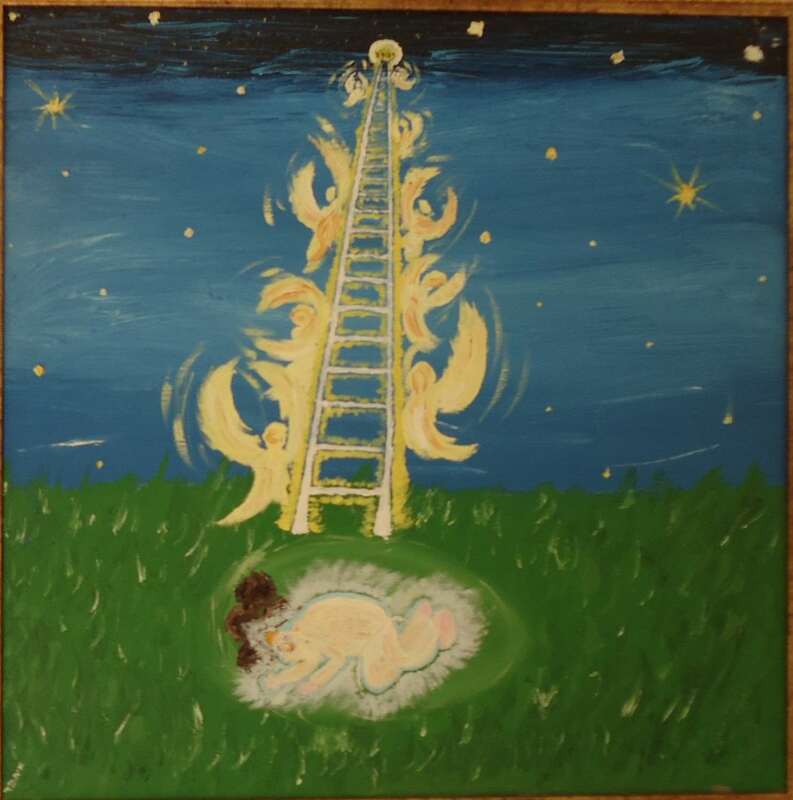 In this painting, The Holy Temple is in the making, in the conception, as before creation...The imagination of the artist, painted as if the temple is in conception, in an egg shell, with angels dancing around. May we merit to see the Temple in its full glory in the Final Redemption soon, Amen! 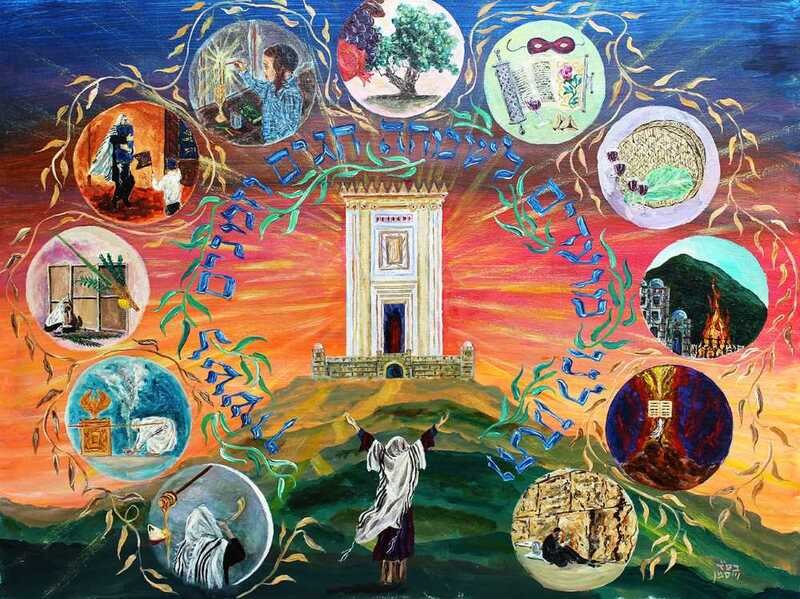 This painting tells of a mini-story with-in the story of the Seven Beggers from the famous book of the great Rabbi Nachman from Breslov – Sipurei Ma'asiyot. It is known that Rabeinu hid many secrets in his stories and that he told these stories in public, to great scholars. 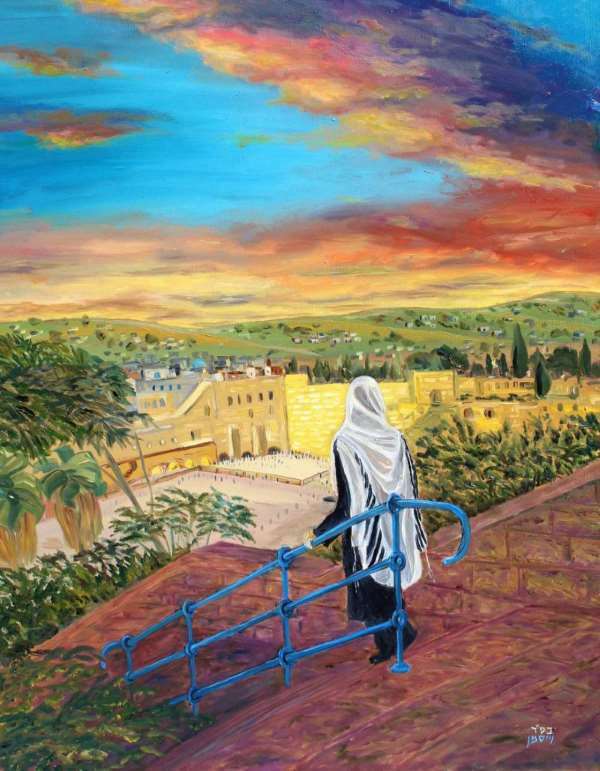 This story tells of the heart of the world - the Jewish neshama of every Yid, and its adventures. The heart yearns for the Ma'ayan - the wellspring of life, which is the Torah of Hashem. The heart so longs to get to it but it cannot get closer- because if it were to get closer it would lose sight of it and it cannot live without seeing it- even in the distance. 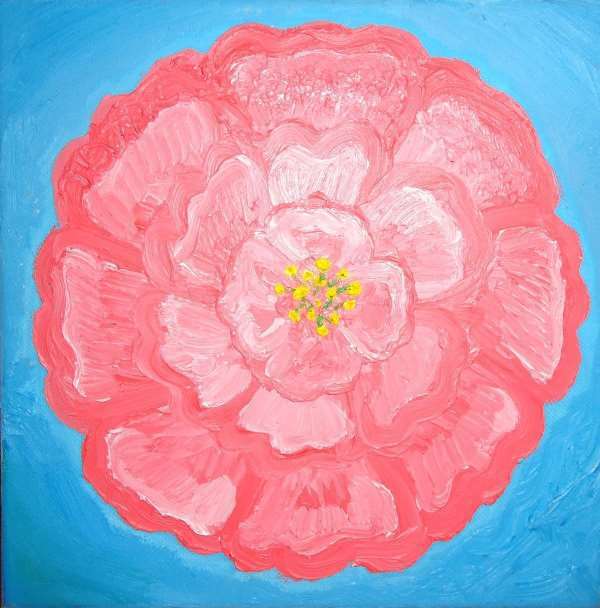 So the heart – our soul - has great yearning which is never fully fulfilled. Another aspect of the soul's troubles, is that it is constantly being bombarded by the heat from the sun - which signifies the ta'avot - the lusts of this world - and it has great suffering from this. An incredible story - please read for yourself. 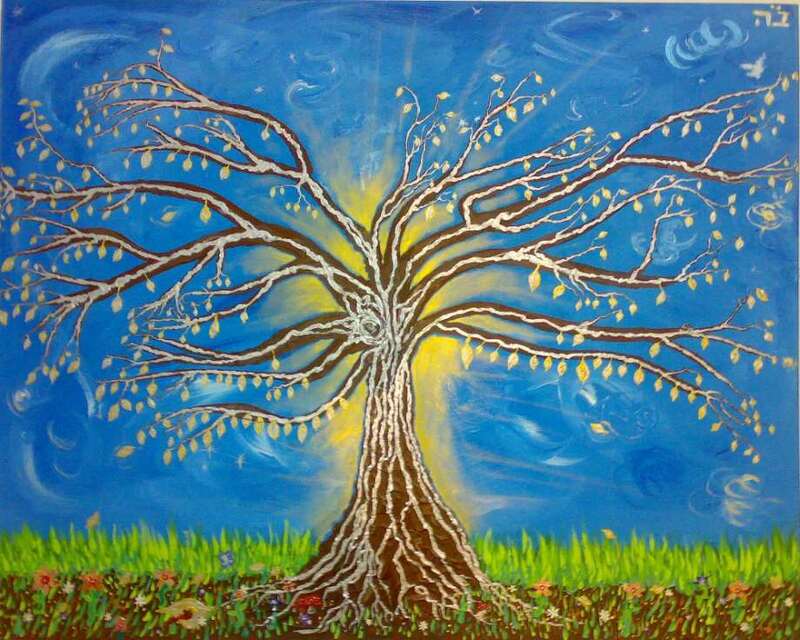 Rabbi Nachman explains - the Tzaddik, the righteous one, is like the tree, which protects the grasses from the sun. Even those far away from the tree are protected, and they do not even know that they are being protected. Such is the Tzaddik, who protects those even far from him and those who do not even know about his existence. May we merit to get close to the real Tzaddikim. Amen. 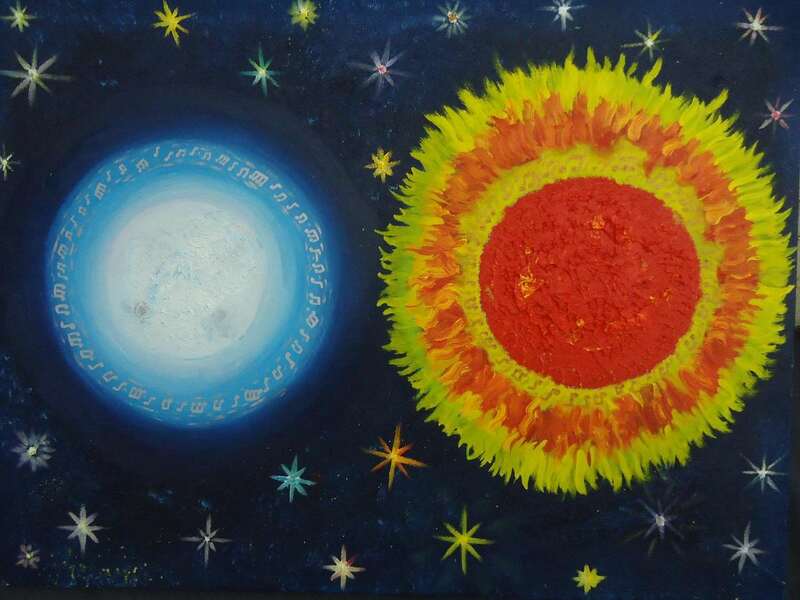 The Sun and the Moon are together in the sky. With their crowns, not jealous with no competition. And the light of the moon shall be as the light of the sun! Speedily in our days. Amen. 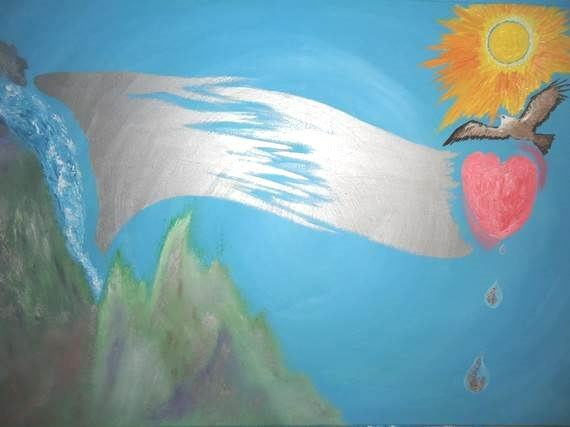 This painting describes the soul. In Chassidut it is explained that just like the flame of the candle yearns to its source and rises upwards, so too the soul of each Jew (which was carved from under the Throne of Glory of the Almighty), strives and yearns upwards to our God - our Father in Heaven. 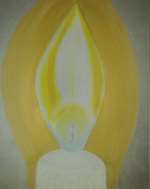 In the word Tefilla, is also the word Petil which is a candle wick. 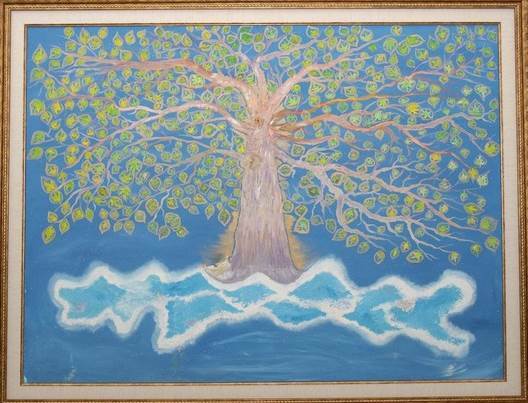 With Tefilla, we raise our souls and feel the spirituality and Kedusha of Hashem's Presence. May we merit to be feel the joy of yearning for Hashem with all our heart, Amen! After fleeing at the command of his parents Yitzchak Avinu and Rivka Imenu, Yaakov dreams a dream. May we merit to dream the Dreams of Tzaddikim, Amen! 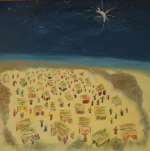 Also seen here is that the camp of Israel is surrounded and protected by the Clouds of Glory, which one of the main reasons that we build a Sukkah today on the Holy festival of Sukkot - to remember the great miracles and kindness that our King did for us when we went out of Mitzrayim. 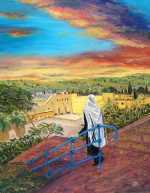 May we merit to have Hashem’s Clouds of Glory protecting us Always, Amen! Yerushalaim, Rabbi Nachman explains, is composed of the words yiraa - awe of Hashem, and shalem - complete. The heart that is full of awe and love for Hashem spreads these Midot (qualities) to the whole body, thereby spreading spiritual and thus physical health to all the organs. 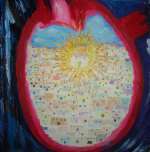 I painted the aorta, the main artery going out of the heart and spreading the blood to the whole body. In the Torah is says that the Nefesh - the soul - is in the blood. In the ancient Jewish Kabbala medical texts (as in Chinese medicine), the heart is the king, who is responsible for all the body's organs. When these Midot of love and awe of Hashem are fixed in the heart there is perfect spiritual and thus physical health. May we merit to yiraa shelema and a healthy heart, soul and body, Amen! This incredible Tehillim chapter and the ones that come after it (which we sing in Kabbalat Shabbat on Friday night), speak of the Redemption (the Geula) and the amazing Simcha that will be at that time. 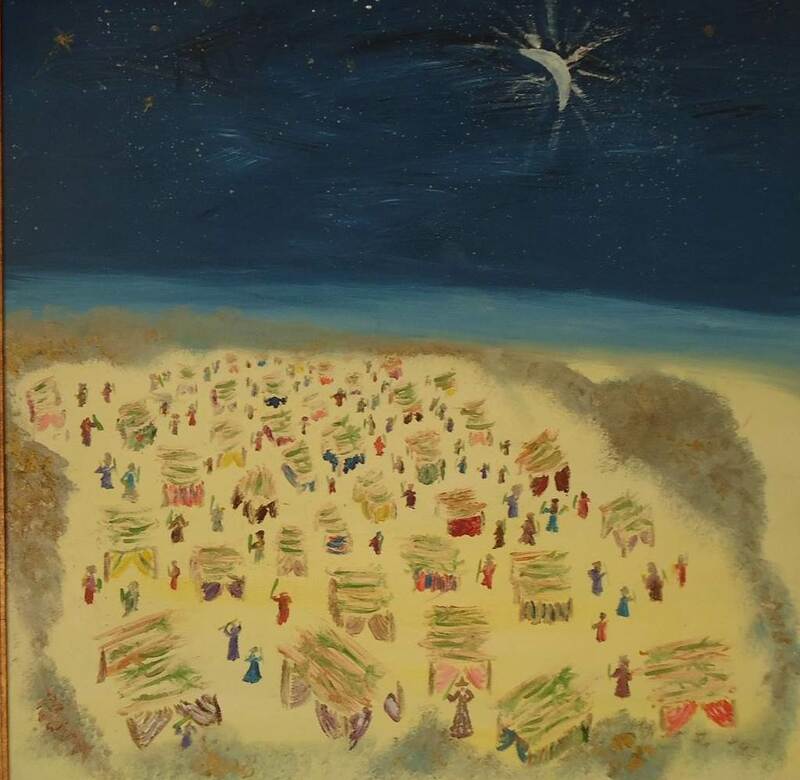 And if they, being that they are plants, will be so happy, it is unimaginable how much joy we, Am Yisrael, the children of Hashem, will have, when He, may He be Blessed, returns to Redeem us. 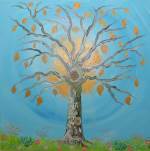 May we quickly merit to rejoice with the trees of the forest together with Am Yisrael, Amen! 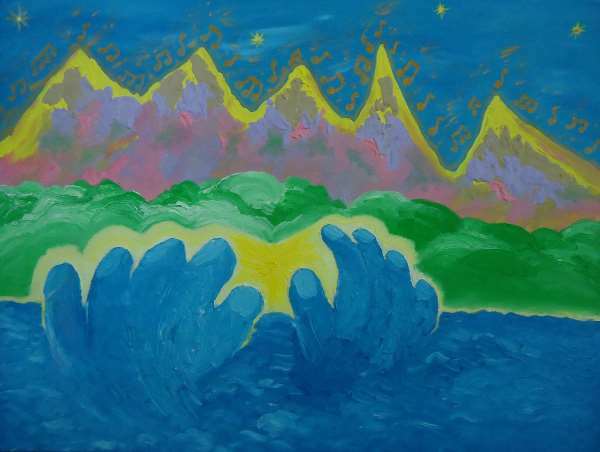 This painting is based upon the Tehillim (Psalm) that describes the whole of creation and its praise to the Almighty Creator, and is filled with inspiration and positive vibes. “And He Will Revive the Hope of His Nation, Praise to All His Servants - to the Children of Yisrael, His Beloved Nation, Hallelu-Yah!” Tehillim 148:14. Quality Wooden Golden Frame (seen above). 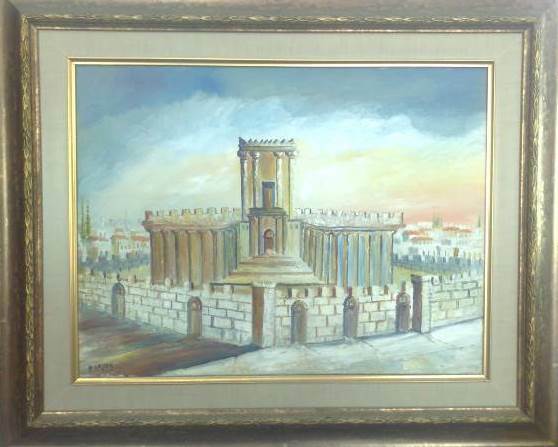 This is a painting displaying the Temple in the ancient Holy city of Jerusalem. Quality Wooden Frame (seen above). 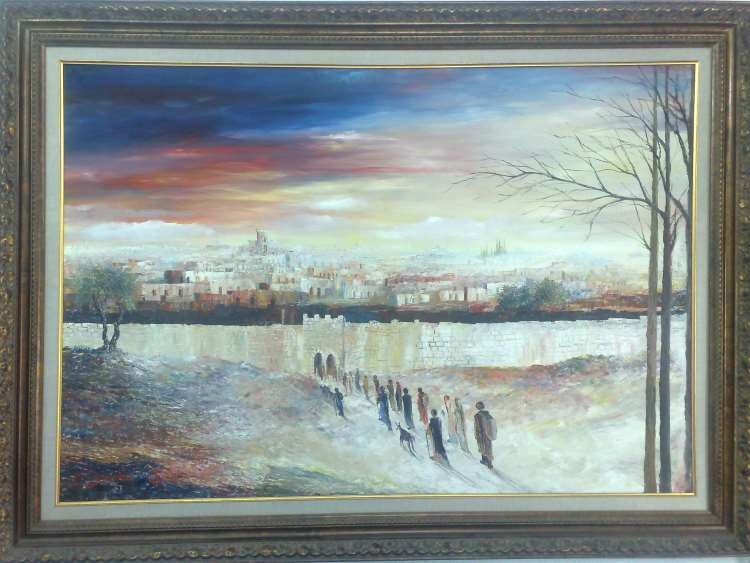 This incredible piece is a painting displaying the people of Israel going up to the Temple in the ancient Holy city of Jerusalem. 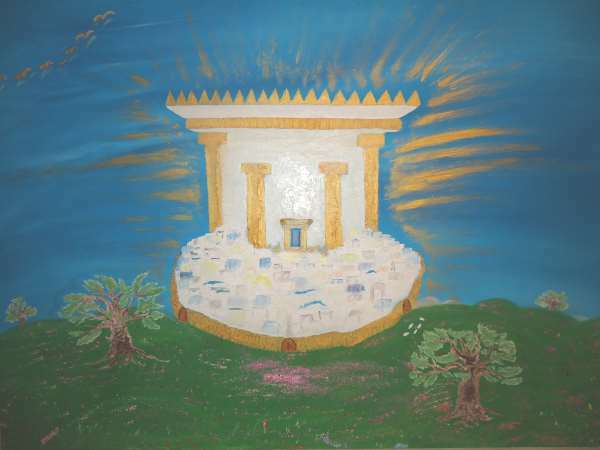 Having it on your wall would be’ezrat Hashem enlighten the house, and those who see it will say, “wow!”, Reminding us all of the coming temple!! The Cotel itself serves the role as a herald of future redemption. 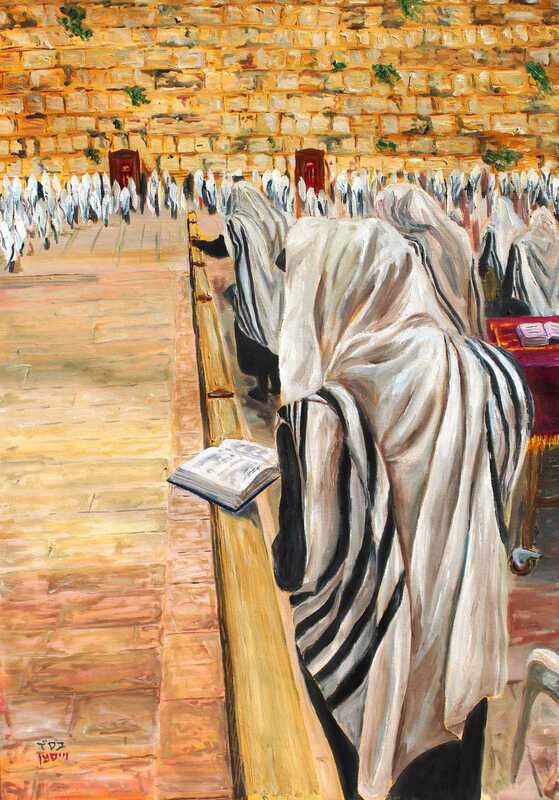 Every Jew, as he or she approaches this holy place, deep in their heart, feels an arousal of hope and yearning for that time in the future when the sword shall be beaten to a ploughshare, and tears of 2000 years of sorrow shall transform into tears of joy and happiness. In fact, the word "Israel" can itself be translated as Direct to G-d. Where more then at the Western Wall does a Jew feel this intimacy? The railing besides the man praying is the artist's way of expressing this "direct route". There is no beauty like the beauty of the Jewish Calendar. Each month offers her bounty and her splendor to the Congregation of Israel. 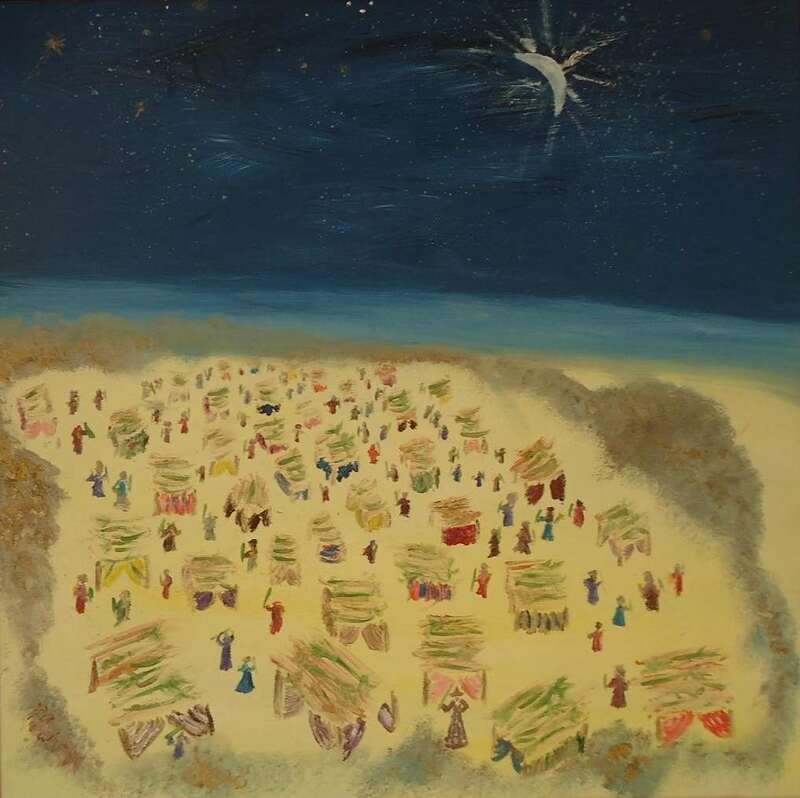 In this painting each holiday (even Tisha B'Av which is destined to be the happiest of days) is embedded in a moon shape, and all the holidays orbit around the central axle of the Jewish people: the Holy Temple, because the actually meaning of the (one of the) word(s) for Holiday : Mo’ed means "coming together", as we all await the time when our Holidays shall be celebrated, triumphantly, at the Jewel of our nation; the Holy Temple.